This is a cute item. It can be used as a Mouse or Dwarf Hamster Agility Run Through or just a fun item in the cage for the animal to hide and sleep in. 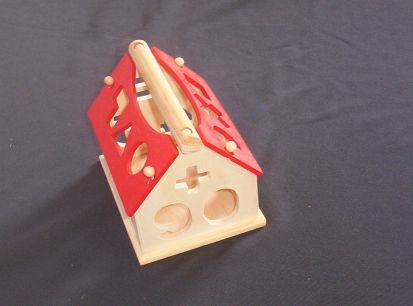 Small or young gerbils and hamsters would also love this piece. With the roof off, most small animals could get in and out of this piece. It is approx 5" long and 4 1/2" tall, it is about 4 1/2" wide, It is all wood and has cut outs all over it including in the removable roof. It comes with the cut outs that are letters and numbers as well as some shapes. Small animals love to chew these. I use one just like this in my Mouse Agility line up of equipment...the only problem I had was MY MOUSE LOVES THIS PIECE and does not want to come out. My husband insists I should put this piece last in my equipment line up so that my mouse runs to it. LOL I think my husband is right. This item will cost more to ship because of the shape and weight. Please note however that you only pay shipping once on our items at Marna's Menagerie/The Agile Rat (that includes all of our websites).